Interview with the RHS Director General Sue Biggs, our plant of the month; Anemone x hybrida ‘Honorine Jobert’, perfect pairing (2 plants that go well together); Anemone × hybrida 'Königin Charlotte' and Hydrangea macrophylla 'Zambia' and jobs to do in the garden this month. File Size: 13.4 MB, Duration: 29' 11"
Interview with the RHS Director General Sue Biggs - 06' 23"
We discuss municipal flower beds in Germany compared to their British counterparts and in particular their use of Cannas and George's foray into the world of judging vegetables at his local show. We also feature an interview with the RHS Director General, Sue Biggs. 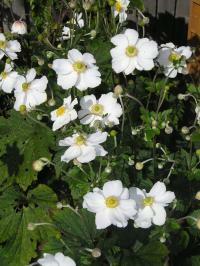 Plant of the Month - 14' 02"
Out plant of the month for September is Anemone x hybrida ‘Honorine Jobert’ also known as Japanese Anemone. This herbaceous perennial has an upright habit growing up to 1.3m tall and 3m spread. They are hardy, need full sun or partial shade and have a long flowering period, but can be invasive. Perfect Pairing - 16' 51"
For the month of September we've picked two plants that compliment each other: Anemone × hybrida' 'Königin Charlotte and Hydrangea macrophylla 'Zambia'. Plants of Note - 24' 48"